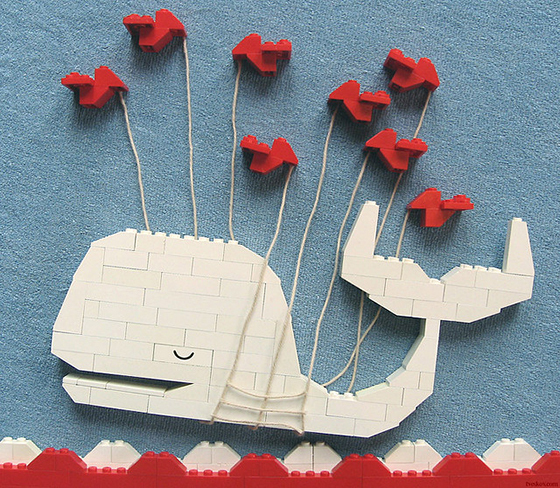 Don’t be a fail whale – test landing page “best practices.” Image by Bjarne P Tveskov via Flickr. Why split test your landing pages? Because you never know what impact a copy or design change might have on your business. Why should you report on your test results? But if the growing body of A/B testing case studies can teach us anything, it’s that there’s no such thing as a “best practice” and that you’d be wise not to base your new landing page on what worked for someone else. When writing copy for a landing page that will convert, the rule of thumb has been to write a clear message, not a clever one. Clarity trumps cleverness, right? As you can see, we got nearly 18% more visitors to schedule an iPhone repair when we used a clever headline and subhead. So does clarity always beat clever copy? Evidently not. In this case, the clever message may have performed best because it more closely matched the conversation in the visitors’ heads at the moment they landed on the page. Perhaps the less formal language felt relatable and echoed the pain they were experiencing. Write the way your audience talks. Join the conversation already happening in their heads when they arrive on your landing page. Contrary to “best practices,” clear copy doesn’t always convert better than clever copy. The prevailing wisdom is that people do not buy products – they buy solutions to their pain. They buy either painkillers or vitamins, as my friends Jack and Adii put it in this book. As marketers, we take that wisdom and we try to turn it into repeatable tactics. We say that people always want benefits, not features, so we should never lead with features. Talk about benefits first! Talk about a great outcome! Talk about value! Do NOT lead with a message about the product itself! But is this always best for conversions? Which of those two variations do you think beat the control? Decided? Well it may surprise you to learn that neither variation 1 nor 2 beat the control. We ended up with flat results on this test. No winner, no loser. As a copywriter, I was pretty floored by the results of this test. 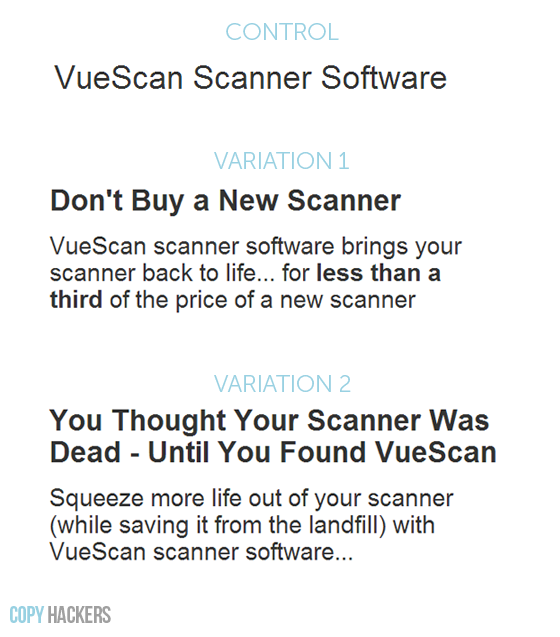 How could a headline like “VueScan Scanner Software” perform as well as headline and subhead combos that better reflect the benefits – and the value – of choosing VueScan? Hopefully your brain is whirring with why that was the case. You may be thinking that it’s because the treatment copy was too long. Or the negative “don’t” was too aggressive. Or the “dead” phrasing was too risky. Or visitors were already plenty aware of the product and their own pains, causing them to glaze over almost any headline. Whatever the case may be, the fact is clear: sometimes, you can lead with your product. But you have to test. 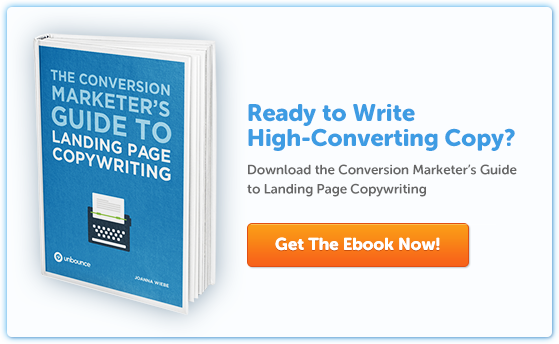 Think your landing page copy should always lead with benefits? You should test that. The 10-word headline AND the 22-word headline both beat the 6-word headline, with 99.4% and 97.8% confidence respectively. On a short copy page! When we look at these results, what can we say? What story do the numbers tell? It’s not that long headlines are best. And it’s not that short headlines are best. It’s that there is no “best.” Sometimes a long headline can outperform a short one. Which means your copy’s success has got abso-freakin-lutely nothing to do with word count. Use as many words as you need to – no more, no less – to connect with your visitor. There are very few facts in the world of copywriting and marketing, but here’s one I can stand behind: there are no best practices. There are only better practices. Because a “sure thing” doesn’t exist. For every winning test that teaches us X, there’s a losing test that challenges the validity of X. What so-called best practices have you seen fail in tests? What did you once believe about online marketing that’s since been destroyed by cruelly inconsistent reality? Share your fails in the comments below.